Check out the week's schedule below to see whats happening on-track, and where we'll be when it is. SPRINT UNLIMITED: A non-points paying race, the Sprint Unlimited is unique in its own way. With an eclectic field of former Sprint Unlimited champions, 2015 Chase drivers, Daytona 500 pole award winners and more- it'll be a wild ride. The format is 75 laps with a caution at lap 25, breaking the race into two segments. DAYTONA 500 QUALIFYING: Qualifying sets and locks in the front row. It also determines the lineup for the Can-Am Duels. Drivers qualifying in odd number positions will compete in the first duel and drivers qualifying in the even number positions will compete in the second duel. We'll be hitting the road to Daytona. Add us on Snapchat @ririnsider and you can follow along our East Coast road trip and see the how RIR gets when we spend just a little too much time in the car together. DAYTONA 500 MEDIA DAY: Join us as we go inside Daytona 500 Media Day. We'll have our ear to the ground to fill you in on the buzz surrounding the start of Speedweeks. We'll be taking a closer look at everything that has gone into the incredible Daytona Rising project, and show you how it's going to change the game for everyone (including your favorite Short Track). What do fans think about the new Daytona? Are they excited for the 2016 NASCAR season? The RIR team will be out and about talking with fans prior to the Duels later that evening. CAN-AM DUELS: Get an early look at some heat-racing action! The Can-Am Duels lock in the rest of the field for the Daytona 500 with each race running 60 laps. The winner of the first Duel will start in third position and the winner of second Duel will start in fourth position. Drivers from the first duel will start in the odd number positions and drivers from the second duel will start in even numbers position. We'll be in the pits and roaming the garages throughout the day. Be sure to follow us on social media and check out our blog for the complete RIR Insider experience. POWERSHARES QQQ 300: Get your first glimpse of the 2016 XFINITY Series field. Rookie of the Year candidate Erik Jones, budding star Darrell Wallace and more will duke it out with Sprint Cup regulars in the first race of the XFINITY Series season - names are made here. 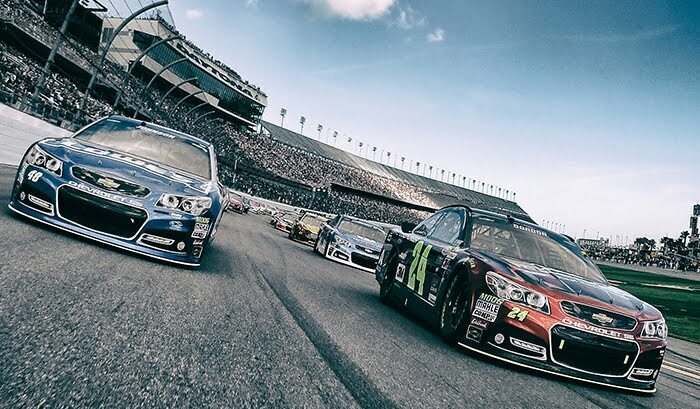 DAYTONA 500: The countdown is over. The 2016 NASCAR Sprint Cup season launches with the Daytona 500 - and we'll be front and center sharing the view.